I am hoping this works. I am not used to doing challenges but I think this works. Its been a very successful day in the craft cave! I used the new in color from SU! and made this little kitty cat - with an inside joke in my family... I combined it with black CS. Its fun together! 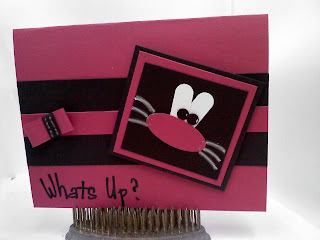 I used a white gel pen for whiskers and used some punches to create the rest of the cat. Love the colors, love the image and it so made me laugh. Great Card!! Super cute idea! Thanks for playing along this week! awesome punch art! This is just awesome! Oh your card is super cute! I love that you used punches!!! Toooooo cute! I love the punch art! Great job with the sketch challenge this week!